Have you ever cooked a Yotam Ottolenghi recipe before? If you've never heard of this chef, you've missed out: his books Plenty and Plenty More take vegetables and put them centre stage. No more boring vegetarian main courses. Buy a book now! It will revolutionise the way you cook vegetables. Pre-heat oven to its highest setting. Put the aubergines slices into a large bowl and coat generously with olive oil, salt, and pepper. Lay them on a baking tray and cook until soft and golden-brown (this took a good hour in our oven). Make the topping for the aubergines by mixing together the black garlic, salt, pepper, 2 tbsp olive oil, the yoghurt and the lemon juice in a food processor until you have a paste. Keep in the fridge until needed. Heat 100ml olive oil in a small saucepan until hot, then add the garlic and chilli slices. Fry for a few minutes, stirring occasionally, until golden and crispy. Remove with a slotted spoon and put on kitchen towel to soak up any excess oil. 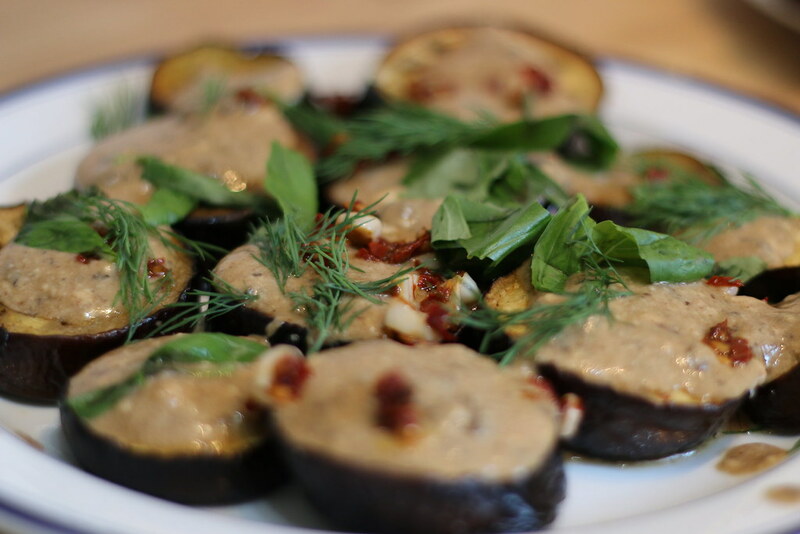 Assemble you dish by laying the aubergine slices flat, and topping with the black garlic paste and fried chilli and garlic. Sprinkle the fresh herbs over the top. Can be eaten immediately or allowed to cool to room temperature. Serve with brown rice and a pulse-based salad with a sharp lemony dressing. These flavours and textures provide a nice contrast. The aubergines reheat quite well in a microwave too, making leftover lunch boxes more interesting.